But perhaps the true reason why the song has inspired for almost a century is the empathy it has for the listener. Its lyrics speak to those feeling powerless, and it empowers them. The sense of worry and dread in the face of death is replaced by strength and joy at a time when the listener needs it most. If you’ve read this blog for any amount of time, you know that I often reference music and certain songs in my posts. The reason why is because good content is good content, regardless of the form it takes. Many popular songwriters have the ability to write in a way that shows empathy for the listener. Creating content that shows empathy for your audience is one of the easiest ways to arrest the attention of your audience. I use the word ‘arrest’ deliberately, because if your content is empathetic to your audience, it forces, it compels them to pay attention. Another powerful way to show empathy for your reader is to create content that is relevant to them. Relevant content is content that provides someone with the information they need, at the time they need it, in the form in which it is most useful for them. Notice that you need to focus on timing and form when determining if content is also relevant. Last March I was in the market for a new smartphone. I wanted to stay with iPhone since I had an iPhone 4S at the time. So I did copious amounts of research on several models, ultimately focusing on deciding between the iPhone 6s, the iPhone 7 and the iPhone 7 Plus before buying the iPhone 7 Plus. But as soon as I bought my iPhone, I stopped reading the articles that compared different models, because I had already made my purchase, the same information that was completely relevant before I made my purchase, no longer was. You also need to consider the type of content that’s most relevant to your audience. Years ago I created a very crude Speaking page to let event planners learn more about me and (hopefully!) hire me for their event. At first, the page just featured a couple of paragraphs explaining the topics I spoke about, and the only picture I had of me speaking. 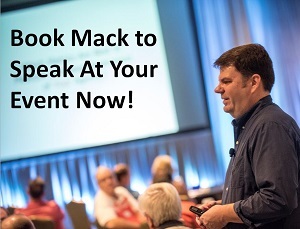 Over the years, I would get feedback from companies and conferences, and I would adjust the content on my Speaking page accordingly. “Do you have any references?” led to my adding Testimonials from past events I’d spoken at. “Do you have any videos of your speaking?” led to my adding, you guessed it, videos of me speaking. By factoring in the elements that made the content more relevant to my audience, my speaking page converted at a higher rate. There are two things you can add to your content in 2018 that will instantly make it resonate more with your audience; Relevance and empathy. Relevant content captures our attention. Over the holiday break I was researching a topic, and as I often do, I was using my laptop while also checking something on my phone at the same time. So my attention was fractured, to say the least. I was scanning google results on my laptop while checking notifications on my phone. Then, while scanning the google results, I found an article that looked like it was exactly what I was looking for, and I clicked over and for the next 10 mins or so I was completely absorbed by this article. I had to laugh when I noticed that I had put the phone down without even realizing I had. The relevant article had completed sucked me in and captured my attention. Relevant content is interesting content. ‘Better’ is all the rage when it comes to customer marketing. Businesses are striving to create better content for customers, a better experience for customers. The first cousin of ‘better’ in this context is a more personalized experience with more personalized content. Even B2B marketers are getting in the game, Account-Based Marketing is one of the hottest trends in B2B Marketing, designed to focus on target accounts vs target markets, with the end goal of giving ‘better’ marketing to these target accounts inside of giving less specialized marketing to a target market as a group. Tools and marketing methodologies, when used correctly, can help your business better understand its customers. But at the end of the day, you have to WANT to better understand your customers. You have to want to understand what a more relevant piece of content would be to them. And not because you want to improve your KPIs or move a needle. But rather, because you know that providing more relevant and interesting content and experiences for your customers WILL result in more sales. Making the customer the priority over the business means you both win. Think about all the hundreds, if not thousands, of ‘rules’ that have popped up in recent years when it comes to content creation. There’s been numerous research studies done into what is the perfect length/form/topic to drive social shares. How to write the perfect headline, how to optimize for search engines, what day to publish your content, what time of the day. Notice how formulaic these ‘rules’ are. Also notice that none of these rules actually take into account the person you are creating the content for. Here’s the only content rule you ever need to follow: Create content that is relevant to, and emphatic toward your audience. Want to improve your engagement numbers this year? Want to increase your conversions? Want to get more people interacting with your content? Sharing it? Contacting you to buy a product because they liked it? 1 – Who am I creating this for? 2 – Why is it relevant to them? 3 – How is it going to help them? Ask and answer those three questions for EVERY piece of content you create this month. Then check your results vs your projections and see how you did. The thing is, we as content creators know why WE are creating that piece of content. We know what WE want to happen, we know what OUR desired outcomes are. But we don’t always put as much thought into making sure that the customer’s needs are met. Which often means our needs aren’t met either. Funny how that works out, isn’t it? Hi Mack, happy new year. Great post, always good to be reminded of the 3 golden questions. another question which I always ask is ‘how will I get the content to the audience?’ With more and more content overload it’s getting harder to ‘connect’ . Hi Belinda! Good idea to also think about how the audience will receive your content. However, I find that if content is truly relevant to your audience, it increases the chance it will be discovered and shared organically! Still, putting thought into how to make the sharing process more frictionless is smart as well. Happy New Year, Belinda!